For wedding breakfasts and celebrations in The De La Bere we can install a stunning fairy light installation, with this installation the lights are fixed at the same height as the high windows in the De La Bere Court to create a fairy light ceiling. The fairy lights look great in the day and even better in the evening and help create a great ambiance. Our fairy light canopy in the De La Bere Court starts at a central high point with strings of fairy lights coming down around the edge of the room to create a canopy effect. Our fairy light canopy works really well when paired with the floral rings in the photo which are supplied by Donna at The Flower Studio, Cheltenham. For wedding breakfasts and evening receptions in the De La Bere Court we can spell out your surname in 4ft light up letters with a smaller Mr&Mrs on top. Our LOVE letters are a very popular addition for weddings in the De La Bere Court. The letters can be located in a number of positions in the room and we are happy for the letters to be moved if you would like the letters in different locations for the daytime and evening. A popular way to personalise your wedding reception in the De La Bere Court at Ellenborough Park. The letters can be located in a number of positions in the room and we are happy for the letters to be moved if you would like the letters in different locations for the daytime and evening. We stock a wide range of sashes that we can use to accessorize the limewash chiavari chairs at Ellenborough, the sashes we stock include ivory lace, hessian and over 80 colours or organza sashes. 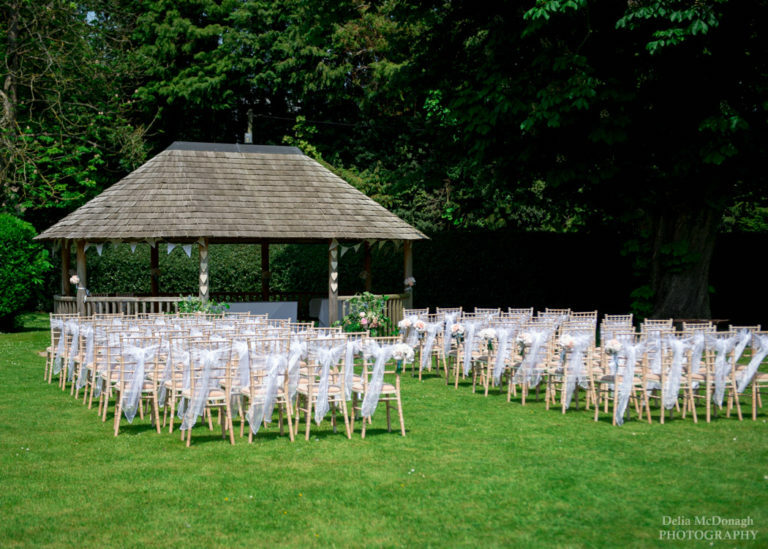 If you are interested in hiring fairy lights, letters or furniture for your wedding at Ellenborough get in touch to let us know the items you are interested in hiring – we can be phoned on 07786 328846, emailed at info@bluegoosehire.co.uk or use our contact form HERE. Once we’ve got your enquiry we will email you an itemsed quote along with details of delivery and collection timings. Once you’ve received our quote we won’t follow it up but are available to answer any questions you have by phone or email.